Chevy Volt really is quite an impressive piece of machinery, and GM knows it would be foolish not to sell it in every country that has electricity. Only North America will be getting the Volt in Chevrolet sheet metal though. The rest of the world will be getting a car called the Ampera. This will be sold as a Vauxhall in the UK, a Holden in Australia, and an Opel pretty much everywhere else. 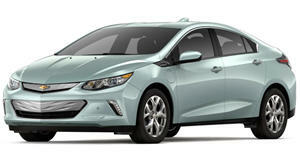 Most of the car looks largely the same as the Volt, but there is a very distinctly different front fascia. The Ampera has a much more futuristic-looking exterior, and this is probably how they plan to market it. In the US, with our longer driving distances and accompanying (and justifiable) range anxiety, it seems that GM has decided to sell it to us on the strength that it can be used like a regular car. It will also be slightly pricier in Europe, but that isn&apos;t expected to hurt sales. A decent range-extender hybrid, but the price of the Chevrolet Volt does hold it back from greatness.